Pictured (left to right). Linda Ohlsen, Activities Director, McPeak's Assisted Living; and Evelyn Grasso, Ellen Sminkey, Ruth Beal and Alex Salmin, Residents, McPeak's Assisted Living. 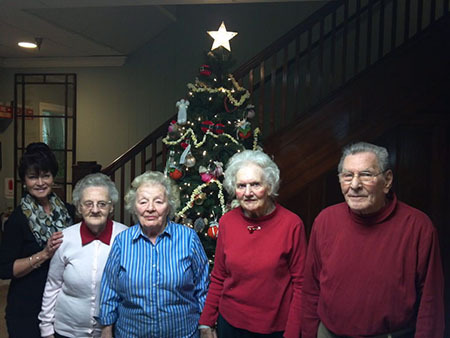 On December 7, residents at McPeak's Assisted Living celebrated the holidays by trimming two of the Christmas trees inside the facility's lounge area and TV room. As residents took turn decorating the trees, they enjoyed egg nog and holiday cookies, listened to holiday music and sang Christmas carols. This year's tree trimming was very special for Linda Ohlsen, Activities Director, McPeak's Assisted Living, as she marked her 25th year in joining the residents in decorating the trees.